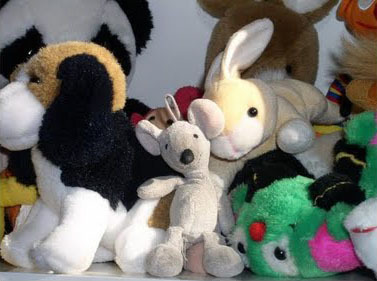 Rosemarie Trevino suggested that members donate gently used stuffed animals and books (can often be found at thrift stores) and bring them to club meetings. She will distribute them to Blue Santa as there is a great need. Please contact Rosemarie for further information. Saturday started with cool temperatures and a little breeze. The fish for the most part must have been on a strict diet because few of them were willing to bite a lure. Of course, there’s always someone who figures out what will trigger a bite and Jesse and Sugein Sanchez did just that. Sugein and Jesse joined the club at the January party so this was their first club tournament. They won the tournament with a total of 8.06 pounds. Fantastic job Sanchez’s. Jerry and Pat Gold brought in 6.92 pounds giving them second place honors. 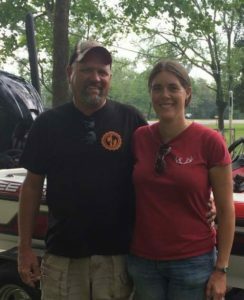 Third was taken by Robert and Lesli Brown with one fish, one 5.37 pound Men’s Big Bass, fish! Fourth place went to the team of Pete and Rosemarie Trevino. Rosemarie took Women’s Big Bass of the tournament. 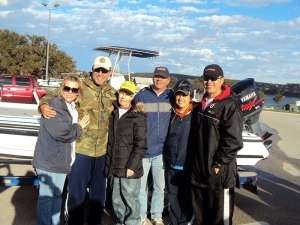 Eleven teams fished the Travis tournament and although weights were low everyone brought fish to the weigh-in. Considering how the bite has been on Travis that was no small feat and attest to the tenacity of MMBC members! The tournament ended with a stiff, cold, north wind blowing over the lake, nonetheless we had a terrific day. After the tournament members went to the Iguana Grill for eating and socializing. Next to fishing it’s our best sport. We had fish tales to tell, good food to eat, and great friends to enjoy it all with. The next MMBC tournament is scheduled for February 27th on Choke Canyon Reservoir. The February club meeting will be Tuesday, February 2, see you there. The new face of MMBC!! Welcome to the new MMBC web site. The site has been built with wordpress, a powerful blogging platform which will allow members to post news, future events, tournament results, photos and more without intervention from the web master.